Bhubaneswar: Odisha Chief Minister Naveen Patnaik on Friday felicitated 24 MLAs with Best Legislators Award for their performance and contributions to enrich the parliamentary democracy. 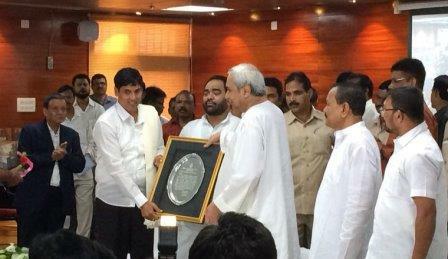 Patnaik felicitated the legislator with ‘Pandit Nilakantha Samman’, ‘Utkal Gourab Madhusudan Samman’ and ‘Utkalmani Gopabandhu Samman’ at the State Assembly. The Utkal Gourab Madhusudan Samman was conferred on Surendra Nath Naik (2009), Bimbadhar Kuanr (2010), Nityananda Pradhan (2011), Umesh Chandra Swain (2012), Bikram Keshari Barma (2013), Rajendra Dholakia (2014), Surendranath Pramanik (2015) and Chakradhar Paika (2016). Likewise, the Pandit Nilakantha Samman has been given to Bishnu Charan Das for the year 2009, Arun Kumar Sahoo for 2010, Pravat Ranjan Biswal for 2011, Prafulla Majhi for 2012, Amar Prasad Satpathy for 2013, Pramila Mallick for 2014, Ranendra Pratap Swain for 2015 and Ramesh Chandra Chau Patnaik for the year 2016. The Utkalmani Gopabandhu Samman conferred to Sanjay Das Burma (2009), Pritiranjan Ghadai (2010), Samir Ranjan Dash (2011), Prashant Kumar Muduli (2012), Bijay Kumar Mohanty (2013), Raseswari Panigrahi (2014), Dibya Shankar Mishra (2015) and Pradip Purohit (2016). Addressing on the occasion, the Chief Minister said in a democratic society, public representatives have maximum engagement with the people. “Citizens vote for them with a hope and aspiration for solving the numerous problems facing the society. This public trust imposes enormous accountability on the part of the elected representatives. Hon’ble members are expected to discharge their responsibilities without fear or favour and with due respect for the high tradition of parliamentary democracy,” said the Chief Minister. Meanwhile, leader of opposition Narasingh Mishra raised question over the selection criteria for the best legislator in the state Assembly.